Let’s talk about what could possibly be the most significant shift in energy preferences since the invention of gasoline — Lithium. This commodity has now formally asserted itself as the go-to energy catalyst of the future and has attracted a flurry of exploration activity worldwide. Considering the commercial snap crackle and pop with respect to lithium in 2016, we wouldn’t be true to ourselves if we didn’t chime in with a host of lithium stocks, bursting with commercial potential. Anticipation is building for one such stock that is positioning itself to ride the upswing coming, with all of lithium’s possible uses and applications coming to the fore. That stock is European Lithium (ASX: EUR). And it picked the most apt ticker code when it listed on the ASX last year: it is now bearing down on mining a 6.3Mt lithium resource at a grade of 1.17% Li 2 O in the heart of Europe , which could be producing DMS (Dense Media Separation) concentrate for the glass ceramic industry in 2018. EUR is currently undertaking technical studies for a PFS and drilling for a resource expansion anticipated for completion in Q3 2017. It also recently announced to market progress of metallurgical optimisation, reporting a spodumene concentrate of 5.3% lithium dioxide from DMS and magnetic separation, which is now being assessed for suitability in glass-ceramic production by a leading European producer. These results have put EUR closer to fast track production . At the same time, like all speculative mining stocks, there is no guarantee an investment will turn out successful. Seek professional financial advice before investing. Meanwhile test work continues into the production of battery grade lithium carbonate and lithium hydroxide for the coming European battery producers. Aside from clashing with the English, Europeans represent one of the most gargantuan commercial markets with over 250 million consumers who spend billions on things like digital gadgets, electric cars and dozens of other lithium-ion battery powered products. Interestingly, there is no major source of lithium on the continent – and Europe is currently a major importer consuming 24% of the global market, second only to China. 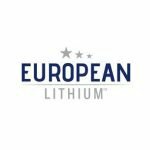 European Lithium (ASX: EUR, FRA: PF8) is an Aussie-bred, Austria-dwelling lithium explorer currently undergoing a Pre-Feasibility Study (PFS) at its flagship Wolfsburg Lithium Project in the heartlands of Europe. 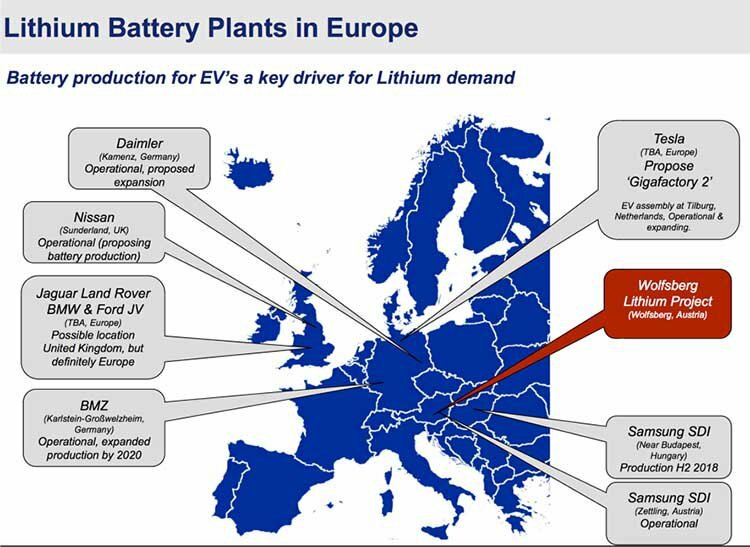 There is no doubt being located in the heart of the EU, right next to industrial powerhouse Germany, will improve EUR’s lithium selling ambitions significantly. EUR has knuckled down since we last wrote about it back in November 2016, in our article, ‘EUR is Drilling Right Now: Updated Resource Due in Coming Weeks’ . It has now delivered an early investor ‘thank you’ by improving its existing resource bulk by 75% and beefing up its contained lithium estimate by 33%. These achievements, amongst others, indicate that EUR is a serious candidate as a lithium producer over the coming years. With prices moving steadily northwards (and continuing to pick up steam), it’s not a huge surprise to see resource companies attracted to lithium like moths to a light. EUR has snuggled itself smack bang in the middle of Europe and is now working up a PFS to get a clearer picture of the project’s future economic viability. There is of course always a chance that EUR’s project at Wolfsburg won’t be economically feasible. That said, if EUR does develop a workable lithium project, it’s ultimate upside could far outweigh the downside risk of getting a piece of the business in such early days, while its market still places such low value on its potential. Let’s go through the caveats underpinning this particular lithium adventurer. The Wolfsberg lithium deposit was discovered and explored by the Austrian state company, Minerex, between 1981 and 1987. However lithium demand and its price at the time didn’t support the development of a fully-fledged mine. But now, on the back of changes in global commodity preferences and technological improvements, the demand for lithium is back on the climb. With the September RTO successfully completed, EUR were readmitted to ASX and got straight to work at the Wolfsberg Lithium Project re-modelling the resource using existing exploration data from Minerex declaring a JORC Code (2012) compliant measured and indicated resource of 6.3Mt at 1.17% lithium oxide . So far the project seems to be progressing well. On February 9, EUR updated the market with a major breakthrough in terms of processing ore at Wolsfberg. EUR reported the progress of metallurgical optimisation, saying it demonstrated the applicability of laser sensor sorting to reject waste dilution from Run of Mine and maximised lithium oxide grade; achieving a spodumene concentrate of 5.3% lithium oxide by Dense Media Separation with magnetic separation. This is now being assessed for suitability in glass ceramic production by a leading European producer. Test work has also commenced on flotation and magnetic separation to produce a flotation concentrate of 6% lithium oxide and by-products of feldspar, quartz and mica. In parallel, test work into the conversion of spodumene concentrate into lithium carbonate and lithium hydroxide is being carried out, using the DMS spodumene concentrate. Over the next three months EUR will work towards the conversion of spodumene concentrate from Wolfsberg into battery grade lithium carbonate and hydroxide. However, note that this is still a relatively early stage mining project, with a number of hurdles to jump through before the company is generating revenue. Invest with caution and keep your own personal circumstances and risk profile in mind if considering an investment. Scroll back up to have another look at Europe’s lithium playing field, which includes EUR’s nearest peers — the likes of Rio Tinto, SMP and Kelliber. Seeing EUR rubbing shoulders with giants in Europe, gives us confidence EUR could be pulled up by its bootstraps courtesy of proximity. EUR undertook a successful programme to verify the Minerex data and obtained a JORC-compliant resource model that is being progressed through to production. 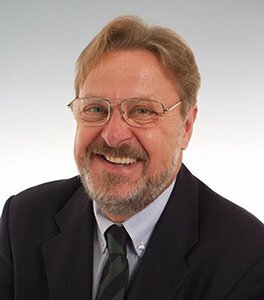 Professor Richard Göd, who was Chief Geologist for Minerex during their exploration, is now Geology adviser at EUR. He helped interpret Minerex’s geological data and how EUR will best utilise it. With Göd on EUR’s side, it’s on the fast-track to ascension from junior-lithium-explorer status. With these initial figures under its belt EUR is on the straight-and-narrow towards generating a commercial harvest. 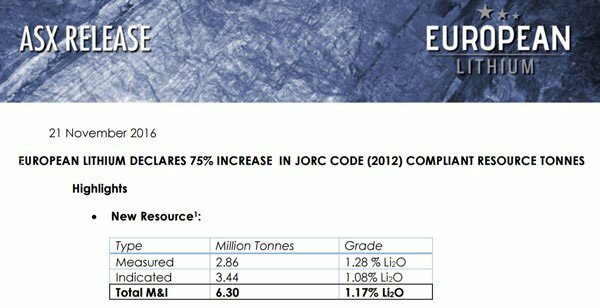 EUR’s total measured and indicated resource is 6.3 million tonnes at an average grade of 1.17% Li 2 O and average thickness of 1.41m . The company is confident that the resource will be shown to extend to depth and to Zone 2, which is the southern side of the anticline. Drilling of these areas is in progress. It’s all well and good that we bang the drum of a provisional small-cap explorer/soon-to-be miner, and we think we have sniffed out a fair few corkers here at The Next Mining Boom, — but what do the industry analysts think? It just so happens, resources analyst Gavin Van Der Wath at EverBlu recently published a comprehensive root-and-branch review of EUR and its prospects. 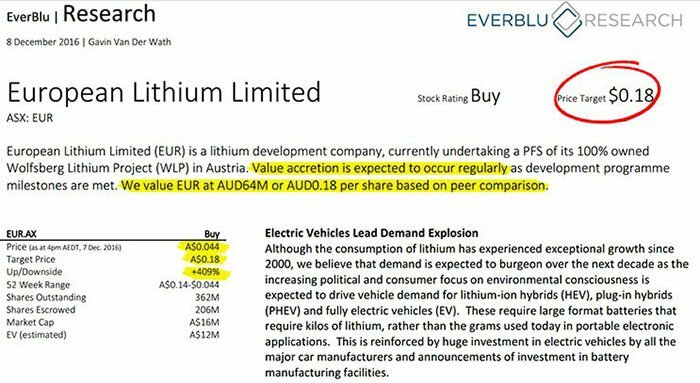 EverBlu has a price target of $0.18, valuing the company three times above its current market value at $0.06 share price. Just as the EverBlu analyst suggests, there is an emerging demand story fuelling the lithium frenzy. And our own macro research reveals demand for lithium is soaring on the back of rapidly growing sales for electric vehicles (EVs) and a burgeoning energy storage industry. 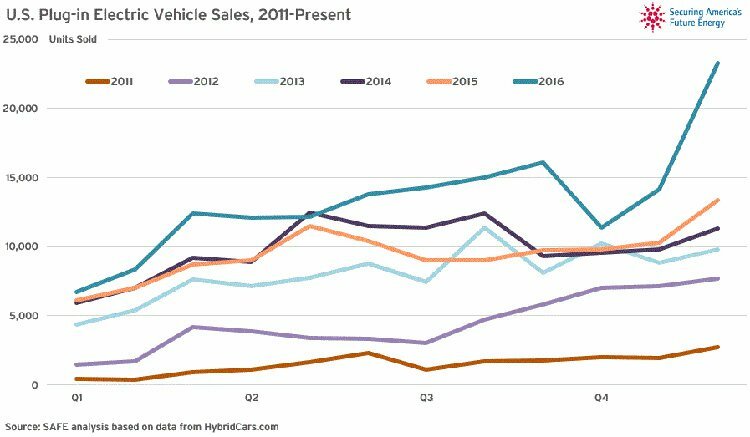 In a sign that EVs are starting to pick up steam, the US EV market just recorded its best quarter on record with 49,000 EVs sold. That’s 7% higher than the prior quarter and a 46% rise from the same quarter two years earlier. In early January 2017, Tesla began operations at its gargantuan gigafactory, kicking off mass production of lithium-ion batteries for its EVs and for its new line of residential, commercial and utility-scale energy storage systems – Powerwall 2 and Powerpack 2. The ramped-up battery production, combined with the rollout of a growing number of new EV models, suggests strong lithium demand in the years ahead. Global research firm, Morningstar, say lithium demand will grow by 16% per year for the next decade, and will have quadrupled by 2025 to 750,000 tons. That is the fastest growth rate of any major commodity over the past century. By mid-2018 when the gigafactory hits peak production, the 35 gigawatt-hours of annual battery production capacity will be nearly equivalent to the volume of batteries that the rest of the world produces combined. There are roughly 33 vehicle models that are either pure electric or a combination of electric and gasoline. But that number will surely grow: Ford alone is set to unveil 13 new fully-electric and electric-hybrid vehicles by 2020. A feedback loop effect promises to accelerate adoption. More demand for EVs and energy storage systems will lower the cost of batteries, making them even more attractive. Battery prices are predicted to fall by an additional 15% in 2017, after dropping 70% over the preceding five years. 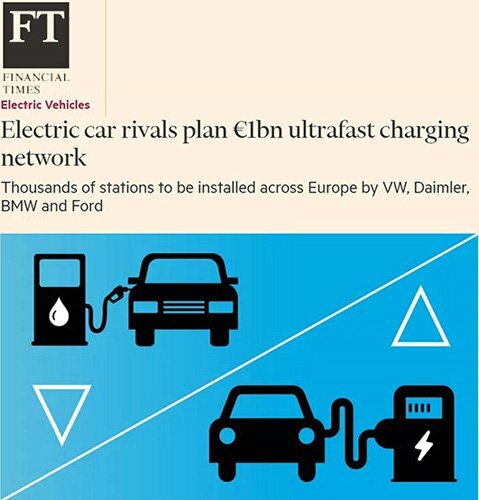 Volkswagen, Daimler, BMW and Ford plan to build 400 charging stations starting this year, with an ambition of having “thousands” available to electric car customers across Europe by the end of the decade. Prices are going stratospheric, junior miners are rushing to stake claims on future supply and investment websites are glowing red hot with speculation about the lithium’s prospects. The Global X Lithium ETF (NYSE: LIT) is a listed fund that offers one of the very few ways to find broad exposure to the lithium sector. 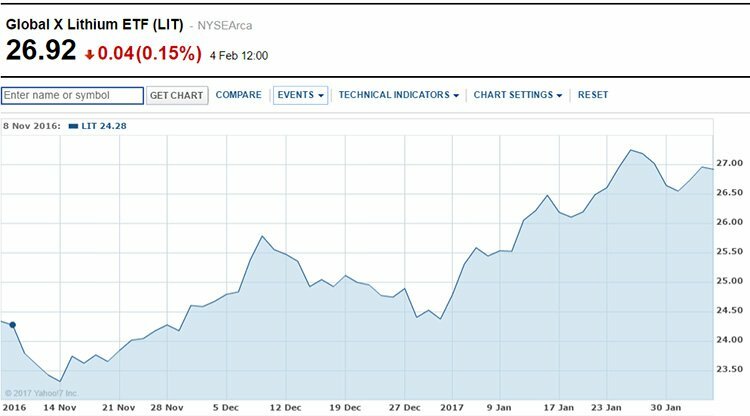 Over the past three months it has gained 25%, reflecting the broad gains seen across lithium stocks. 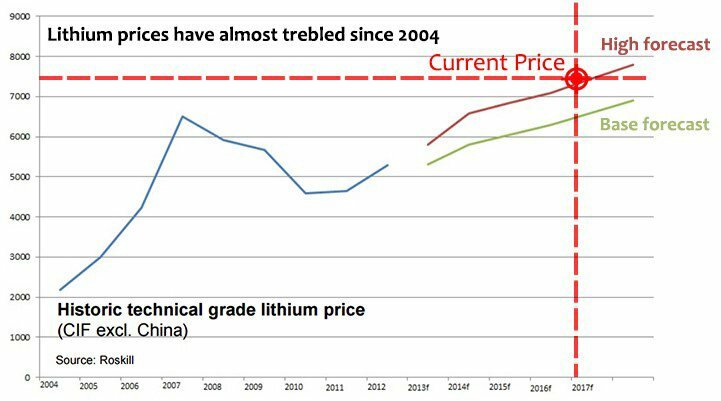 One other key factor making the lithium market more opaque, yet highly opportunistic given its early stage of maturity, is pricing. Trade between lithium suppliers and consumers typically involves a small number of producers and their customers, negotiating in private and without a centralised venue such as an exchange. ... and just four producers controlling about 85% of global supply. Chile’s SQM and US companies FMC Corp and Albemarle Corp dominate the production landscape, extracting lithium from salt lakes in Chile and Argentina. Albemarle also operates a brine operation in Nevada. The fourth producer is Australia’s Talison, which produces lithium at the Greenbushes mine in Western Australia. But it is hardly an independent, being 49%-owned by Albemarle and 51% by China’s Tianqi Lithium, which takes almost all of the mine’s output to China for processing. With sales expected to triple by 2025 to about $US6 billion ($7.9 billion) a year, lithium may exceed the size of the market for tin, a metal used widely in cans and steel. For EUR, this is a great market to be catapulting itself into. As a new energy revolution dawns, so too does the prospect of bumper sales of lithium-ion batteries. The rate of growth in EV’s has surprised even the most bullish market analysts, and this year looks to be just the beginning of lithium’s stellar rise. Whereas previous years recorded subdued trend growth, from 2016 a much steeper growth rate has emerged. This is compounded further by the fact that EV’s have claimed only 1%-3% of the automobile market to date. Tesla seems to be placing its faith in a new generation of lithium producers, signing prospective off-take agreements with Bacanora Minerals, the owner of the Sonora project in Mexico, and with Pure Energy Minerals, which is working on the Clayton Valley project in Nevada. Meanwhile, a host of EU-focused manufacturers are jettisoning to build EU-based EV plants and lithium-based infrastructure anticipating the same EV rush seen in the US. Lithium demand is rising fast. So fast that many commodity investors and analysts are hailing the dawn of something bigger. As more nations and societies embrace electric vehicles and battery-powered energy storage technology, demand for the building blocks of that new source of energy (lithium-ion batteries) will grow for years, if not decades, to come. Think of the introduction of petrol at the dawn of the automobile age in the early 1900s. This is before grid storage is even considered, which is set to outstrip electric vehicle demand, and the rising use of consumer electronics. Throw in population growth and greater spare capacity in Asia and you get significant investment opportunity offering exposure to a commodity with a great deal of upside. However, commodity markets do fluctuate and caution should be applied to any investment decision here and not be based only on future projections of commodity markets. Seek professional financial advice before choosing to invest. 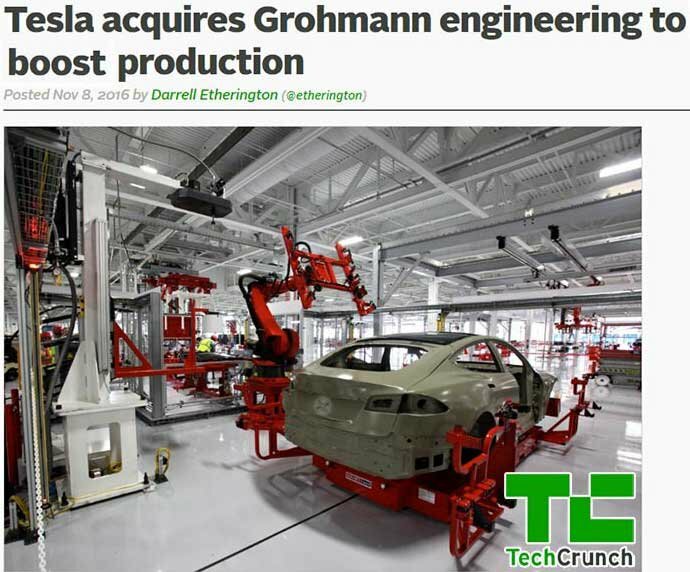 If you thought Tesla’s Gigafactory plans were audacious, we can’t wait to see what the European response will be. When coupled with China’s insatiable appetite for self-sufficiency, national abundance and future-proof global competitiveness — we think lithium could turn out to be one of the most pivotal commodities in history. 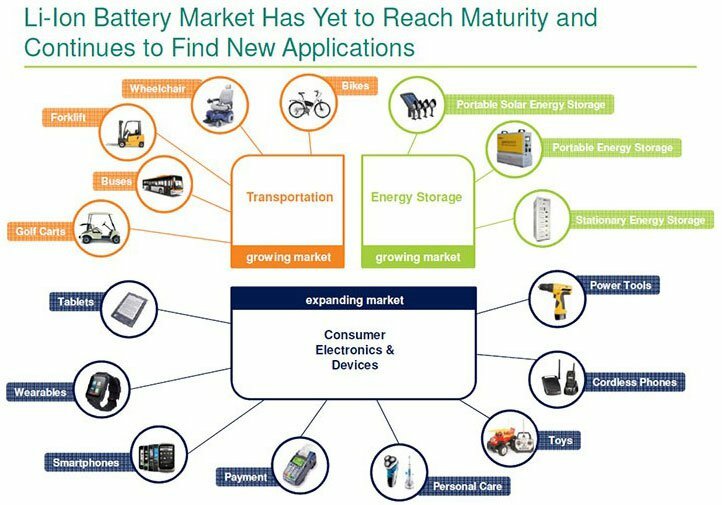 The lithium-ion battery market is forecast to expand to $46.2 billion through 2023 — that’s an 11% average annual growth rate. It’s no wonder that renowned billionaire investor Warren Buffet is investing heavily in lithium, especially in view of the shortage expected by banks and market analysts. In fact, Buffet’s Berkshire Hathaway has backed BYD to become China’s single largest electric car manufacturer with a 10% stake in the company. The switch to cleaner and more efficient electric vehicles is being written into legislation. 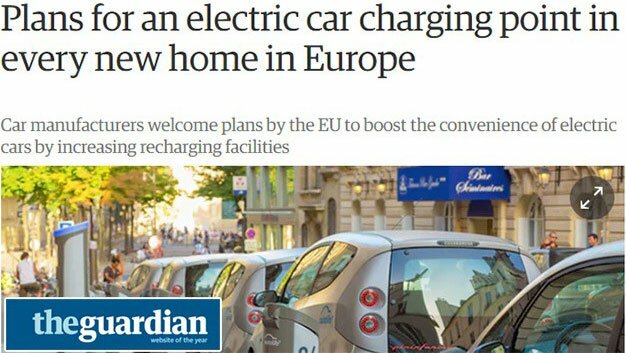 Europe is working towards mandating electric vehicles directly into law with the Netherlands leading the charge on this front. Dutch legislators have mandated all new cars be electric powered by 2025. Germany is considering similar action too. Taking a look at EUR’s schedule, we think now could be a good time to initiate some early positioning in this dark horse stock. 2017 is a crucial time for EUR, during which the PFS will be finalised, its Resource expansion given a formal stamp, products introduced to off-takers and it embarks on finalising its DFS and permitting for 2018. Concurrently, this year has also seen the macro lithium story gain more traction as lithium demand estimates creep higher. 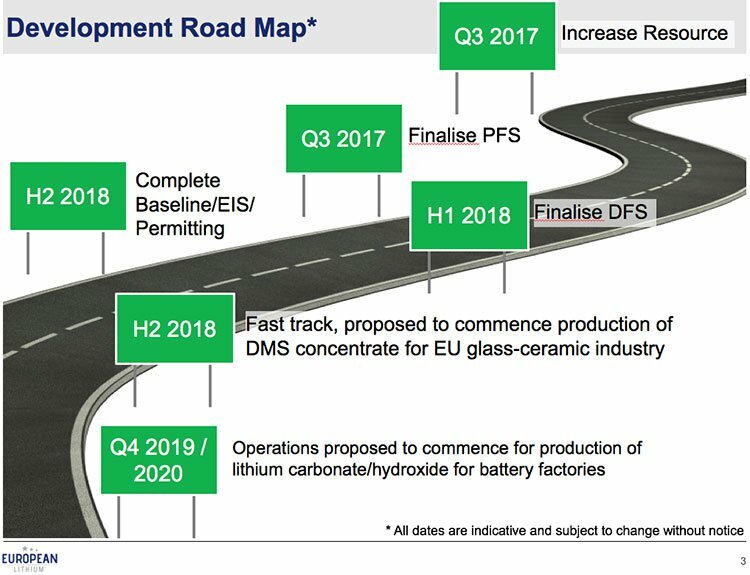 With such a rich kaleidoscope of factors converging nicely into EUR’s hands, it’s a no-brainer to see EUR taking up an early starting position in the fast lane of lithium exploration.